Listen to your favourite songs in music player. It supports MP3, AAC, AAC+, eAAC+, WMA, WAV, AMR etc. file types. With so many shortcomings and so little nice surprises to offer in return, the BlackBerry Curve 8520 isn't an easy handset to recommend. Maybe if the BlackBerry service is essential to you and your budget is so limited that you cannot afford the better looking Curve 8900 or the more functional Bold 9700 then this may be your only option. Excellent value (providing you buy it at Walmart). Will BlackBerry's entry-level smartphone lure you in? 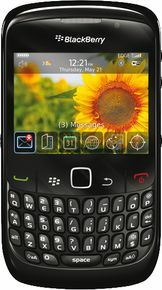 It is a very helpful and good phone to use, its OS supports almost every software and BlackBerry World is awesome for it. BlackBerry World, is very helpful and nice, new apps for free. Easy to use phone, basic and must have features. All In All nice phone. The Side Areas, made of plastic have very poor durability, not so good. 3G and GPS not supported.